This International Exhibition includes many disciplines with no theme and juried by Jennifer Casler Price who has been the curator of Asian and non-Western art at the Kimbell Art Museum since 1993. Grand Prize Winner: Solo Show in our Main Gallery at Art7, a storefront gallery located on Crockett St. in Fort Worth's bustling 7th Street area. The Grand Prize winner will also receive $2000. Runners Up: Group exhibition occurring simultaneously as the solo show in the Back section of the Art7. People's Choice: Single artist who receives the most likes on Facebook will receive a cash prize $250. Jennifer Casler Price has held the position of curator for Asian and non-Western art at the Kimbell Art Museum since 1993. During her tenure, she has curated over 20 exhibitions covering a diverse range in subject matter including Buddhist sculpture, Chinese antiquities, Japanese ukiyo-e painting, Tibetan Esoteric Buddhist painting, Mughal painting, African sculpture, Oceanic art, Maya art, and most recently a retrospective exhibition on the architect of the Kimbell, Louis I. Kahn. As a curator she has traveled widely - to China, Japan, India, Cambodia, Vietnam, Turkey, Cuba and Peru. She has also juried exhibitions for the Dallas Business Committee for the Arts, the San Antonio Art Museum League and the Fort Worth Main Street Arts Festival. Jennifer has been a commissioner on the Fort Worth Public Art Commission since October 2014 and currently serves as Chair of the Commission. She has been a member of the Association of American Museum Curators (AAMC) since its founding in 2001. 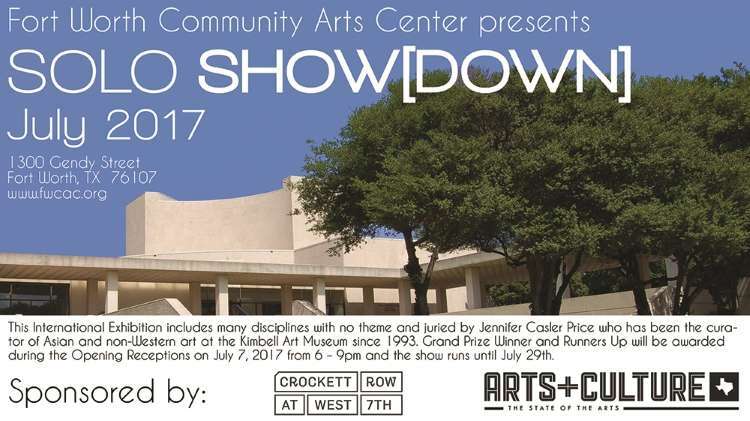 It was an honor to be asked to be the juror for the first annual Solo Show(Down) presented by the FWCAC. The international invitation received submissions from across the country as well as Asia and Caribbean. Of the 28 artists chosen, while the majority are from Texas, I am pleased that there is representation from the East and West coasts as well as the Midwest. Overall I was very impressed with the level of sophistication of the entries. My final selections were inevitably guided by my own personal aesthetics and the objective to choose works of the highest artistic caliber, but within that framework I also wanted to present a range of styles and media.